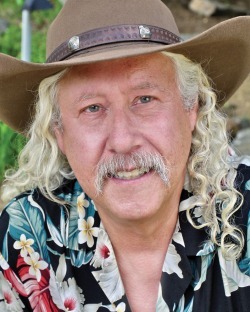 HOUSATONIC—Arlo Guthrie presided over a trio of shows this weekend at his Guthrie Center that was sometimes moving, occasionally ramshackle, and ultimately winning. His presence, in a sense, could not be escaped on Friday evening, although it didn’t take physical form—he was forced to skip the first show, apparently due to a back injury, and was not on the premises. But Arlo was on hand for Saturday and Sunday, steering a large band including daughters Cathy, Annie and Sarah Lee, son Abe, grandchildren Krishna and Sophia, and son-in-law (via Sarah Lee) Johnny Irion. Some more grandchildren hopped (or crawled, depending) around onstage for a few numbers, showing great poise but mainly cranking up the “aww” factor. The theme was Woody Guthrie lyrics put to music by contemporary artists, and the group launches a long national tour this week that will take it into mid-May. A sub-theme was Woody’s songs for children, particularly those found on “Go Waggaloo,” an upcoming album credited to Sarah Lee Guthrie and Family. (Irion remarked that the goal of the album was to record children’s music that “wouldn’t make you want to jump out of a minivan.”) Yet several of the songs on Sunday, like “Green Rocky Road” and “In Times Like These,” are trusty stalwarts of Arlo’s usual set. He also elected not to take a turn at the piano set up at the center of the stage, perhaps because of the back injury. An unexpected side effect was to transform “City of New Orleans” from the piano-driven ballad it’s become in performance to something more resembling the folk rock of Arlo’s early albums. The big band was really clicking for the slyly profound “Gonna Get Through This World” (Woody as rendered by The Klezmatics), and Pete Seeger’s “Sailing Down This Golden River.” The latter’s poignant melody was voiced by Arlo on harmonica, as Sarah Lee took lead vocals and Irion added subtle piano voicings. But with three generations of Guthries onstage, and Woody’s presence even more keenly felt than usual, the offhandedly profound hymn had special effect. “My peace, my peace, is all I’ve known/ My peace is worth a thousand times more than anything I own,” the lyrics go. On Friday, the group had trouble remembering the words. On Sunday, with two performers holding toddlers in their arms, and the patriarch onstage noting that his late grandparents dreamed of the day their whole family would travel around the country together playing music, there was not a word—or an emotion—awry.